05/12/09 - 0900, 1210, 1400. Douglas Ferreira. 06/12/09 - 0900. Douglas Ferreira; 1210, 1400. 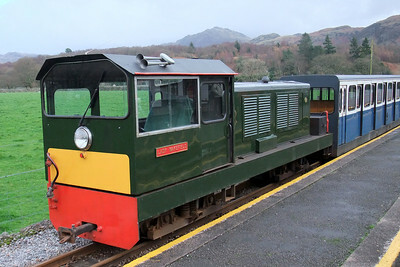 Lady Wakefield. 12/12/09 - 0900. Douglas Ferreira; 1210, 1400. 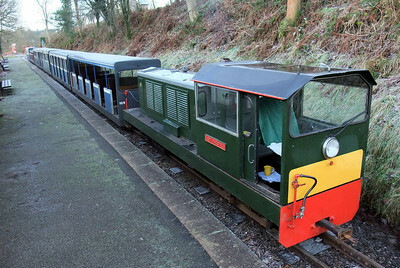 Lady Wakefield. 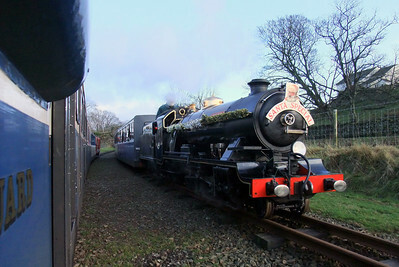 13/12/09 - 0900, 1210, 1400; Lady Wakefield. 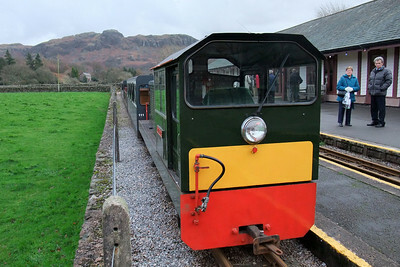 19/12/09 - 0900. Lady Wakefield; 1210, 1400. Douglas Ferreira. 20/12/09 - 7 miles. River Irt; 7 miles. Douglas Ferreira. 26/12/09 - 1020, 1220, 1440. Douglas Ferreira. 03/01/10 - 1020, 1220, 1440. Douglas Ferreira. 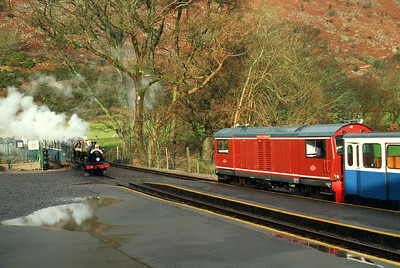 River Esk arrives at Dalegarth, where Douglas Ferreira sits in the sun, with the service train, 05/12/09. 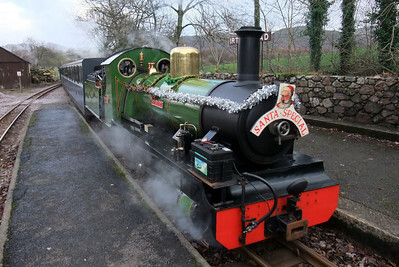 River Esk, on the Santa Express, arrives at Dalegarth, 05/12/09. River Esk at Dalegarth, 05/12/09. River Esk gets underway heading west through Irton Road down loop, as seen from the guard's van of the up train, 05/12/09. 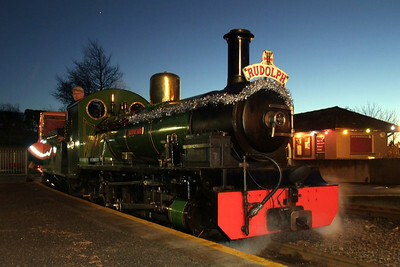 River Irt stands tall at Ravenglass in the evening, on Santa's Sleigh duties, 05/12/09. 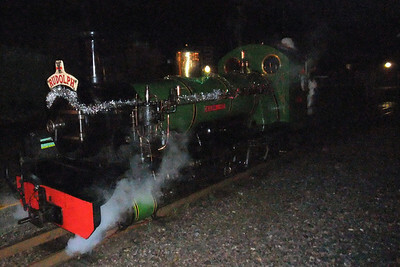 River Irt at Ravenglass in the dark, 05/12/09. 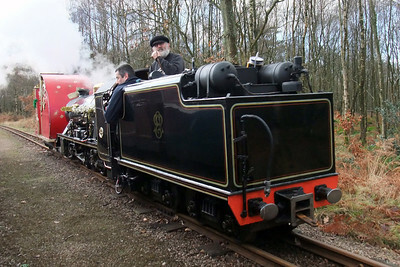 Peter van Zeller keeps a lookout aboard River Esk at Miteside loop on the sleigh, 06/12/09. 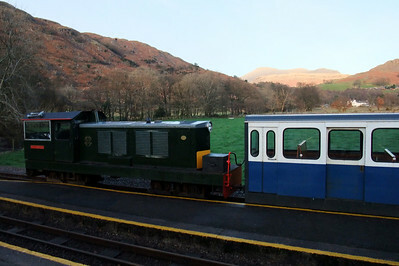 Lady Wakefield rests at Dalegarth between duties, 06/12/09. 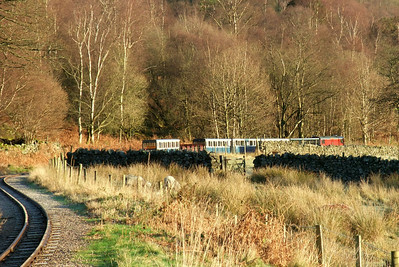 Lady Wakefield in the back road at Dalegarth, 06/12/09. 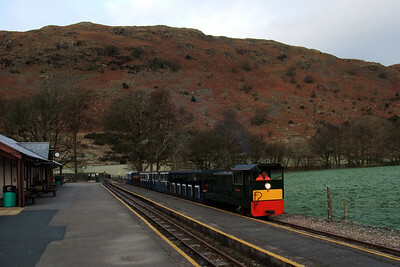 Lady Wakefield and the short service train at Dalegarth, 06/12/09. 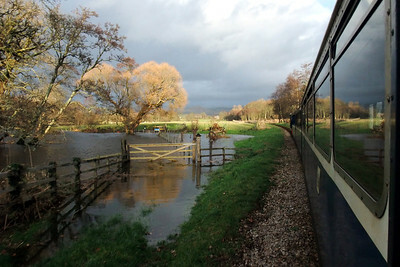 Passing a flooded Muncaster Mill at high tide, 06/12/09. River Irt steams into Irton Road on a down Santa special, 06/12/09. 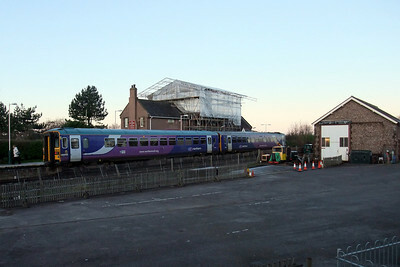 A pair of Northern Rail Class 153s call at Ravenglass on a Saturday morning - note the scaffolding around the roof of the Ratty Arms, repairing the fire damage, 12/12/09. 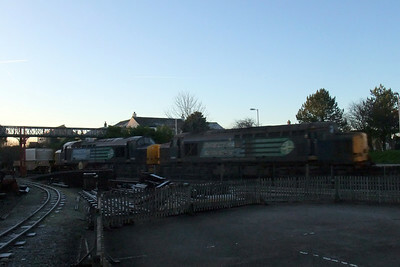 37601 and 37667 head north through Ravenglass in the shadows with 6C53 Crewe Coal Sidings - Sellafield, 12/12/09. 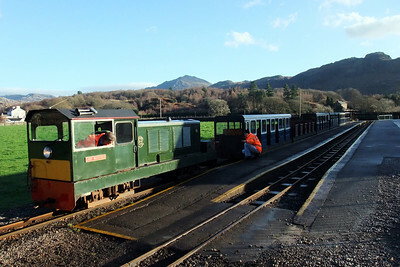 Douglas Ferreira and train sit at Hollin How summit, while the traincrew undertakes sanding duty on the railhead, 12/12/09. 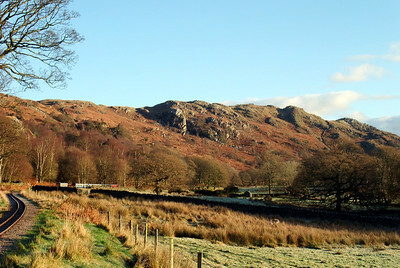 Hollinghead Crag dominates the Eskdale skyline at Douglas Ferreira with RANDER 90 sits at Hollin How Summit, 12/12/09. 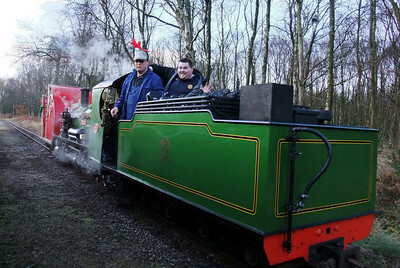 Driver David Moseley and Guard Will Tilston are aboard River Irt as she heads, tenderfirst, through Miteside loop with the sleigh, 12/12/09. 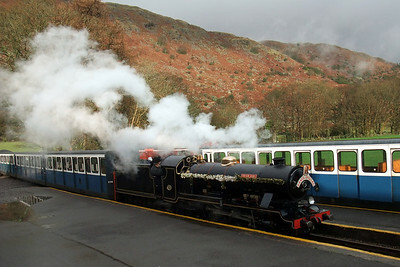 Lady Wakefield is coupled onto her train at Dalegarth, 12/12/09. 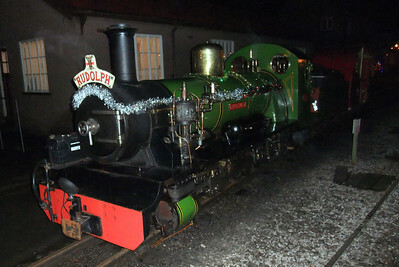 River Irt at Ravenglass, 12/12/09. 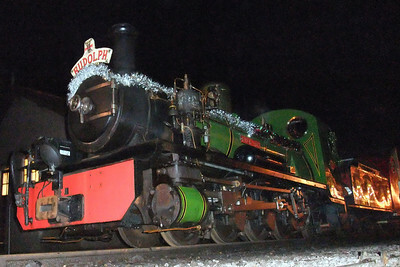 River Irt and Santa's Sleigh sit at Ravenglass, 12/12/09. 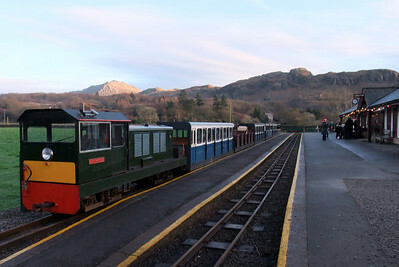 Lady Wakefield pauses at Eskdale Green, 13/12/09. 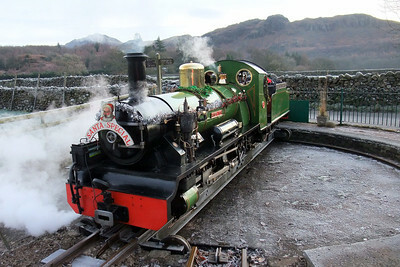 Lady Wakefield, seen here at Eskdale Green station, 13/12/09. 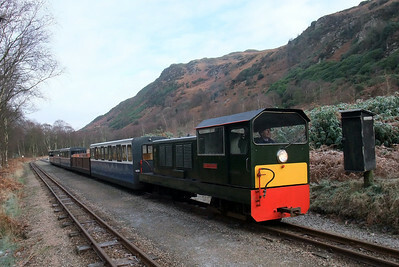 River Irt arrives at Dalegarth, passing Lady Wakefield, 13/12/09. 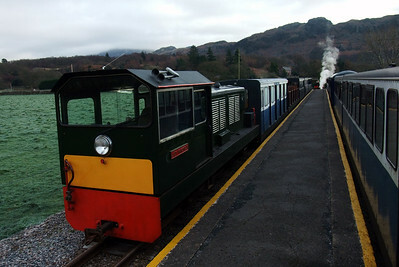 River Irt on Dalegarth turntable, 13/12/09. 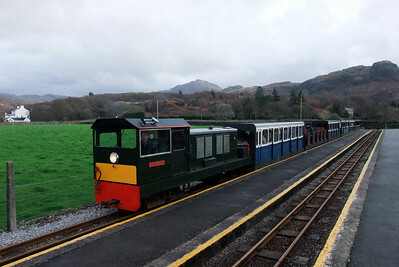 Lady Wakefield waits for departure time at Dalegarth, 13/12/09. 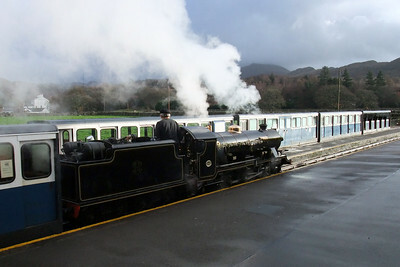 Lady Wakefield at Dalegarth, as a local brass band plays carols on the platform, 13/12/09. 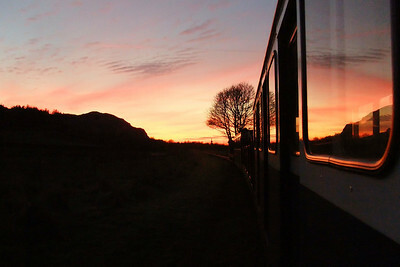 Miterdale sunset as the final down service train of the day leaves Irton Road, with Lady Wakefield at the helm, 13/12/09. 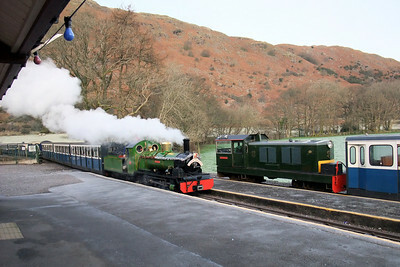 Lady Wakefield sits at Dalegarth as the newly-arrived Santa train, hauled by River Irt, stands alongside in Platform 1, 19/12/09. 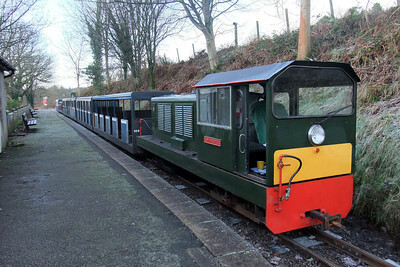 Lady Wakefield rests in Miteside loop, 19/12/09.